"Scientists Rock" is a seven-part video series created for Asteroid Day introducing you to the people working to protect us from asteroids. Narrated by Neil deGrasse Tyson. Featuring Brian May, Chris Hadfield and many others. 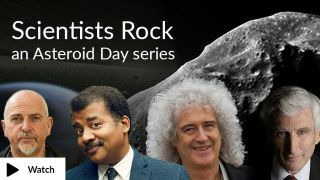 Get ready for Asteroid Day (June 30) by watching an awesome video series narrated by astrophysicist Neil deGrasse Tyson. Called "Scientists Rock," the seven-part sequence discusses asteroids and their influence on Earth and its inhabitants. The online videos include guests like Brian May, an astrophysicist best known as guitarist for the rock band Queen, and Apollo 9 astronaut Rusty Schweickart, both co-founders of Asteroid Day. Bill Nye, science celebrity and CEO of the Planetary Society, is also featured, as is Canadian astronaut Chris Hadfield. Ed Lu, a physicist and former NASA astronaut, and Carol Shoemaker, an American astronomer and comet discoverer, will also chime in. The series talks about the importance of asteroid detection and characterization, as well as the role of asteroid deflection. The need for international cooperation and emergency response is discussed, as is the role of amateur astronomers. The entire series, as well as other information about asteroids, can be found on the website for Asteroid Day on Friday (June 30), and will be broadcast as part of a 24-hour event that day (starting Thursday evening in the United States). In addition to "Scientists Rock," the website contains a vlog on asteroids that is updated monthly, as well as a video describing the history of International Asteroid Day. Videos for this year's Asteroid Day, as well those from the past, can also be found there.